Nearly 3/4ths of the surface of our Earth, “the blue planet,” is covered with water. Water is characteristic of biological life in the universe as we know it. How much water would the Earth hold if it were the size of a globe? 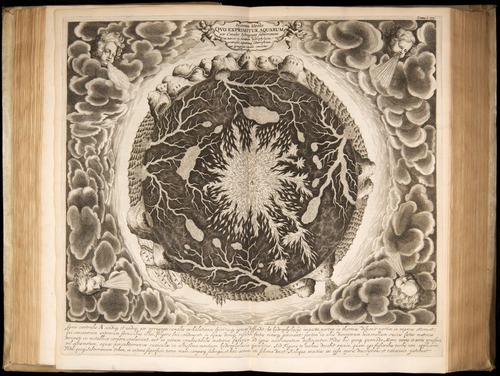 In Kircher’s drawing, can you identify the Earth’s oceans? Subterranean water? Is the Earth more like Naboo or Tatooine? The US Geological Survey maintains a page explaining how much water the Earth actually has, including excellent graphs to show where it is located in the oceans, glaciers and ice caps, groundwater and surface water (here ). To model these statistics, obtain a globe, blue food coloring, beaker, graduated cylinder, and teaspoon. Fill a pitcher with water and color it with blue food-coloring. Set it beside an empty 500 ml beaker. Ask students in turn to pour into the beaker the amount of water they think the globe would hold. When several students have hazarded guesses, proceed to the next step. Download Pages file or pdf. Ask a student to fill the beaker with the total global volume of water for the globe. Hold it up and let everyone see it. How close is the result to the previous guesses? Because it’s expensive to remove the salt from ocean water, take the beaker and pour enough water back into the pitcher so that all that remains in the beaker is the total global fresh water. Then remove the water in the ice caps to model the remaining water, and remove the ground water to model the surface water. At some point you will need to pour the beaker water into a graduated cylinder instead, or use the rule of thumb that approximately 5 ml = 1 teaspoon. Anyone getting thirsty? Ask students to comment on the significance of the total global water volume. In addition to inferences they draw about conservation and pollution, emphasize that the model is merely a static picture, frozen in time. One conclusion to draw is that water cycles rapidly on Spaceship Earth. Although rivers, and water running from our faucets in our homes, appear virtually inexhaustible, a finite amount of water is moving rapidly around and around through the water cycle. Matter cycles through any ecosystem like water circulates around the globe. Tip: This activity is an excellent follow-up to a water cycle bracelet activity, and works well at the introduction to the study of ecology, before discussing C, N and other matter cycles. This entry was posted in Education, Nature and tagged Ecology. Bookmark the permalink.